April 1981 must have proved that incorrect for you and that was 22nd(ish) April. I was 5 so I can't recall it. Snow in March can be good but April I can only recall one day events gone tomorrow. I have to say though reading the last 24 hrs I am surprised people are getting worried about zonal in November, it's going to be a long five months for you. As we're only 2/3 of the way through autumn it seems strange to be fixating on winter. The morning's charts are mostly fairly benign especially for the south - UKMO makes a bit more of next weekend's colder incursion than 00Z GFS but HP soon returns from the SW. GFS seems keen to have the Azores HP in its usual November position - midway between the Azores and Ireland - keeping us in a mild run of WNW air. ECM continues to play with heights to the east and north east but not very convincingly it has to be said and, like GEM, plays with shortwaves in the Atlantic giving as rather messy overview by the second week of next month. As usual, GFS OP FI toys with weakening or displacing the PV but this is a trick it often plays and rarely verifies. The PV Looks to be setting up as you would expect at this time but it's very early days. October last year including Halloween. If I remember garden path was more like yellow brick road. All winter I jumped onto charts like this. I won't be doing that this year, but the last month of autumn is going to be a cliffhanger. We weren't that far from a colder winter would love to see plenty of heights to our north. but perhaps at the moment ECM is onto something. 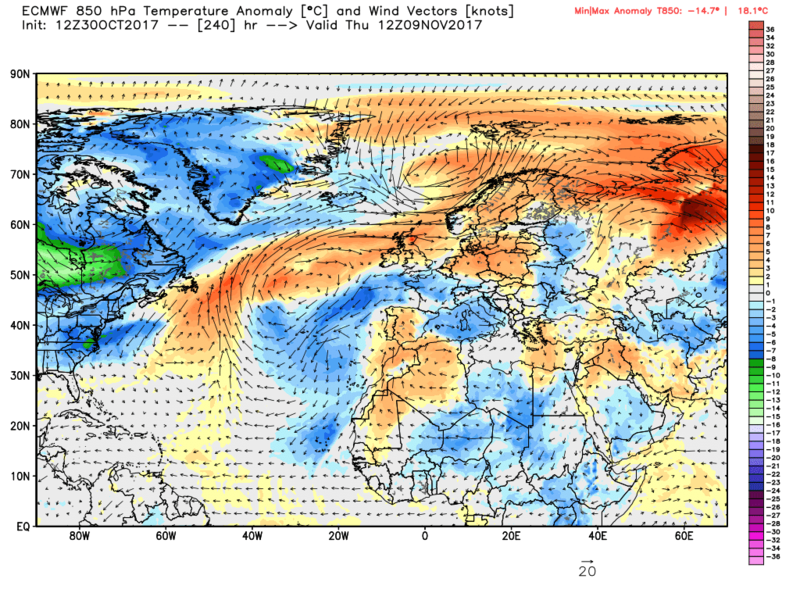 would love to see a Scandinavia ridge and then retrogression to Greenland Iceland location. Ah, but here's point worth noting. Although it felt fairly pleasant in the Sun when it was facing us, as one who has spent a lot of the day outside I can attest that as the Sun got lower and l'ower you could feel the chill gaining strength. I've been round my dad's all day as he's been gardening and I've walked home 3 miles along country lanes and public footpaths to get home in the dark and I've seen my breath in the air tonight for the first time in months. So it's hardly warm out there. Plus I don't believe even in late October that comfortable daytime temperatures under clear skies (lets be honest that's all its been at best) are in any in any way unusual. Indeed indeed!! I felt hot in the sun ... but I wouldn't have worn a t-shirt in the shade, absolutely! Coldies ideally would want that control run repeated nearer the end of the month. It seems like only yesterday we were discussing another non-event winter and before you know it the fun season is fast approaching again. Now that I’ve come out of my hibernation I look forward to sharing all the inevitable drama in here over the next few months, not sure what my obsession will be this winter . For regulars not sure if I’m quite ready to drop my MJO fixation! In terms of today’s outputs the first signs of our nemesis setting up in its favourite place over Greenland but it could stay far enough to the west to allow some build of pressure to the east ne. Some brief interest develops around day 6 with a toppling ridge , the UKMO looks the coldest set up as it holds back the PV, the ECM pulls in a ne as the ridge topples. 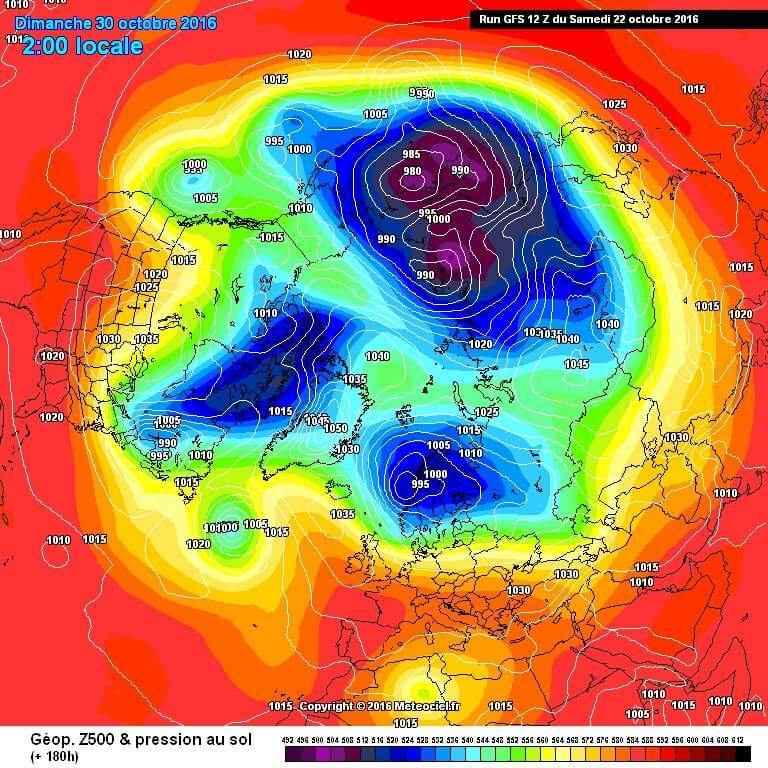 That timeframe could get a bit more interesting if a stronger ridge develops to the west nw but it’s almost certain that it will topple, so just depends how far north this can get into Scandi. Anyway nice to be back , fingers crossed that this winter can deliver something interesting. Welcome back Nick.  I'm similar, I wait for the hour to go back then I know the winter season is starting . Looking forward to another roller coaster of a season. What's this? Nobody mentioning the mighty CFSv2? ;-) Although ECM and GEFS showing average autumn weather for the next few weeks, the CFSv2 between 15-30 days out shows some cold anomalies for Europe, including the UK. Something to watch for and see if any sign showing in the next EPS weeklies. I am reading alot of mild ramping this winter. But it isnt the same winter as last year or the previous years. We have a Easterly QBO and a la nina. So expect something more early 90s. Can we please only discuss what the Model Outputs are 'showing' in here, There is a Winter hopes/ramps/thoughts thread open for anything other as we head into the last Month of Autumn. Looks like an early test for the ECM, given its bias to overdo ridges to the ne. The GFS isn’t interested in developing that short ne n flow that the Euros do, it’s much flatter upstream , the UKMO T168 hrs then quickly flattens the ridge with less extension to the ne. 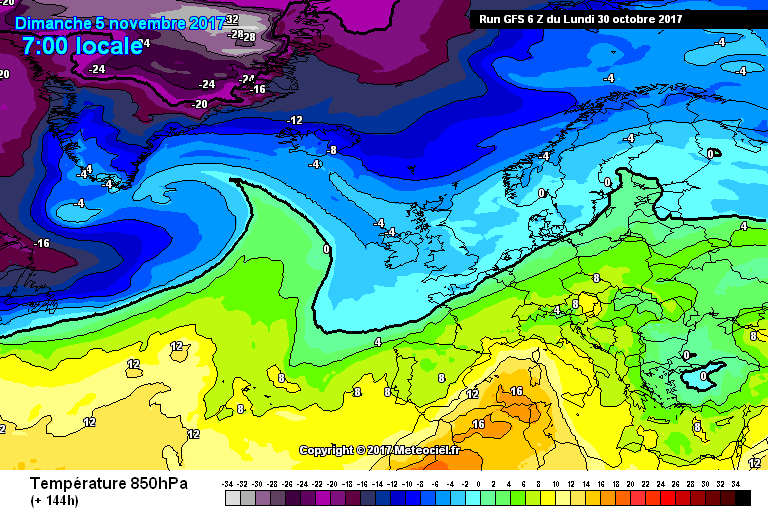 It’s really only the ECM which tries to develop the ridge extension towards Scandi. I’m more dubious of the ECM over recent winters with it often raising interest post T144 hrs which then implodes on subsequent outputs . Any conditions which bring down the ground and sea temperatures in advance of winter are welcome as far as I am concerned. The ext period of the EPS anomalies are indicating that the amplification that occurs towards the end of the ten day period, with the weak trough sinking south between the two ridges will be short lived but moving forward from that it does like the Azores ridging NE in the vicinity of the UK. Good news if this becomes the trend. 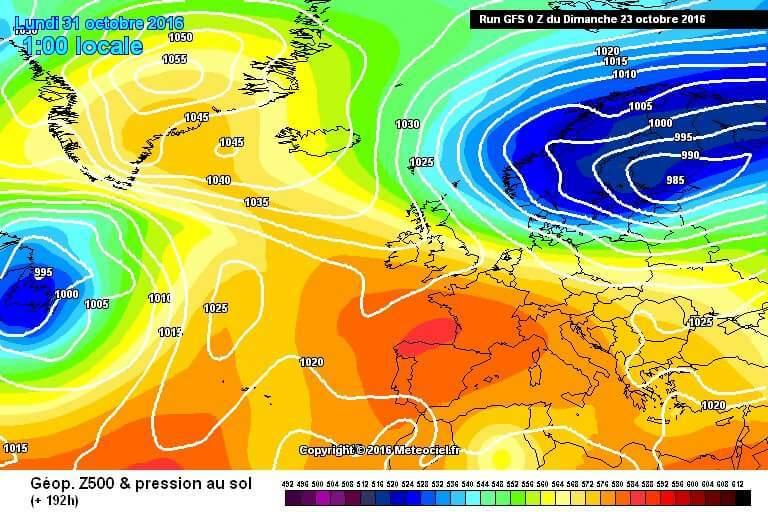 Albeit in deep FI but the GFS now develops a stonking big ridge but I'm changing my view this winter anyway, we've had so many recent winters where we've had decent blocking too early, I actually want a rampant PV to develop early this year, I will explain my theory the nearer we get to December once we know whats happening more but the basic theory is that if the inevitable period of VI is earlier, the earlier any SSW could be rather than be firing blanks in late Nov, then VI occurring throughout Dec and Jan and being reliant on spring to deliver a few flakes, I know this view wont be popular with the strat guys as it goes against most things we have learnt on these threads over the last 9 years, just a hunch that things have changed. Brave call , a rampant PV always gives me night terrors of mild mush south westerlies . Both the GFS and UKMO at T144 hrs agree on that PV edging towards south Greenland but interestingly try to develop some ridging to the ne .The GFS is reluctant to push the pattern east so perhaps the ECM might develop more ridging to the ne given its morning trend. Good run to run consistency from the ECM. Of course, only time will tell whether its good accuracy or not! Is the ecm good or bad for cold ? Trending shockingly bad by day 10 with the Azores ridging north east. 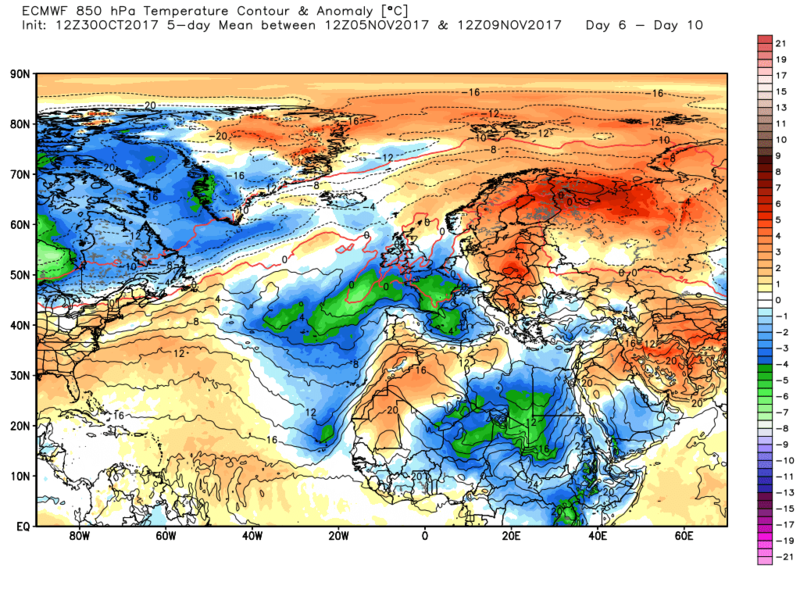 Nothing out of the ordinary in the models for mid-Autumn.Signs of the Greenland/Canadian vortex growing but as yet the Atlantic jet not into full gear so the most unsettled conditions further north with quite a lot of dry weather around for many. Still enough wavering in the jet stream flow to see the odd burst of Polar air coming south for a day or 2 with the next visit likely around 4/5th November following a few milder days. 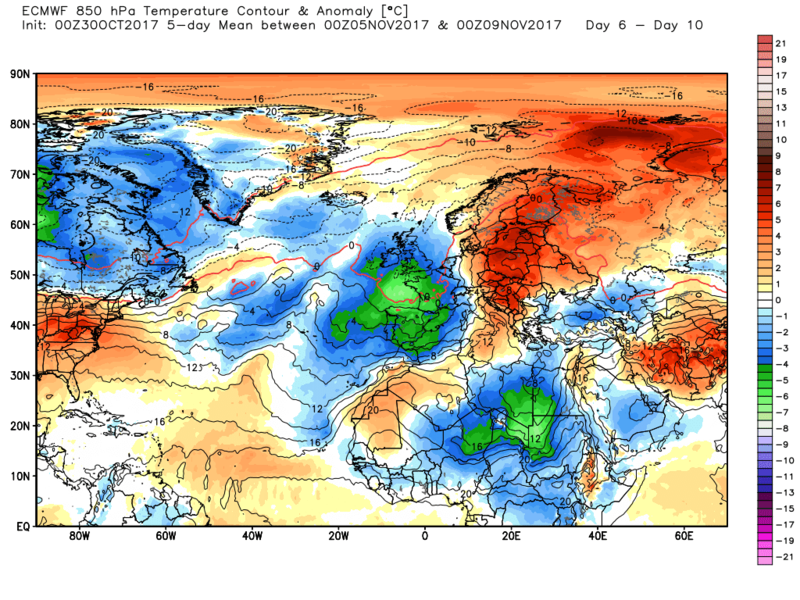 Just the usual interplay between heights further south and the Greenland trough with the most active weather in the far north. GFS 12z ensembles showing things cooling right down as we progress through November, a few colder and a few milder members but the mean tells the story. Pretty seasonal November coming up I'd say.